The Washington County Commissioners acknowledge a letter to Sheriff Scott Owen in their meeting Monday morning. The letter regarded the Jan 29 jail inspection performed by the Oklahoma Department of Health. Sheriff Owen attended the meeting, and Commissioner Mitch Antle commended him for his upkeep of the jail. The Oklahoma Department of Health saw no issues with the jail's operations. 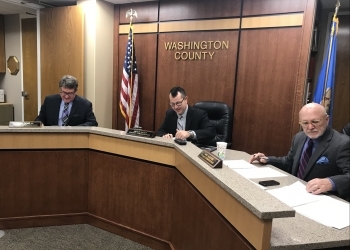 Also in the meeting, the commissioners approved a request and benefits for the Washington County Election Board Secretary for the month of January in the amount of $4,234. A report from the Election Board for January in the amount of $3,082 was approved as well. The Washington County Clerk’s Cashbook and Summary report followed. The commissioners approved the $32,575 mentioned in the report. They would go on to approve reconciliation from the county clerk in the amount of $937,427. A report of Officers from the Washington County Court Clerk for January ended the commissioners meeting. They approved the $172 amount in the report.